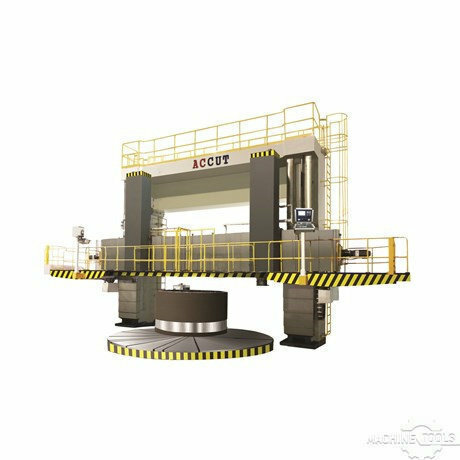 VTL series CNC double column vertical turning lathe can automatically machine various workpieces made of iron metal and ally, non-ferrous metal and non-metal materials. Spherical surface, cylinder surface, cone, thread, end surfaces, inner and external groove can be cut on this lathe. The lathe can carry out cutting with surface constant velocity. The lathe is suitable for large components machining in the industries of heavy duty machinery, power generation, shipbuilding, metallurgy and etc. Looking to Purchase a New ACCUT ACCUT-VTL-63CNC? Looking for a USED ACCUT-VTL-63CNC?Have one to sell?